Let insects spark curiosity and critical thinking in your classroom! After four years of offering exciting and engaging field trips at our downtown location, the Missoula Insectarium is ready to get its wings! In the summer of 2019 our lease will run out but a new state-of-the art facility is being designed in partnership with the Missoula County Weed District & Extension Service. 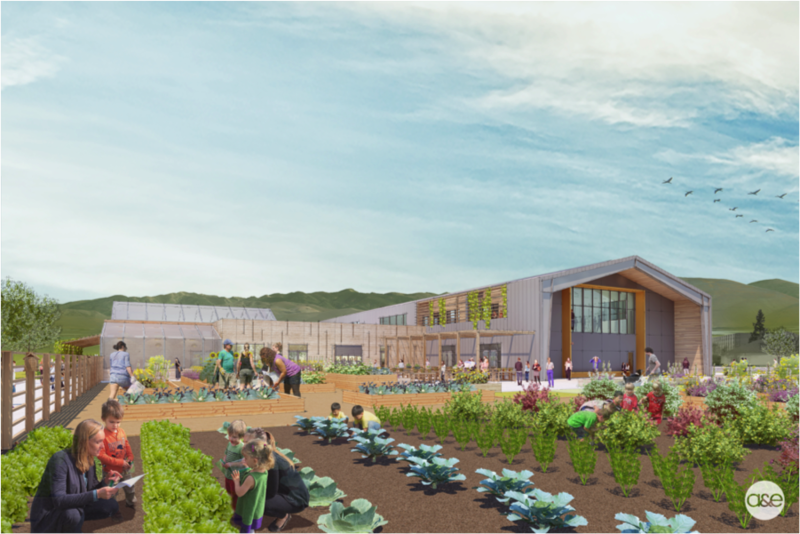 The new facility will be located at the fairgrounds and will feature a larger classroom, tropical butterfly house, larger exhibit space, outdoor classroom, demonstration gardens and more. As we transform we will offer engaging in-class programs to the Missoula community and surrounding area. An architect’s rendering of the future Missoula Butterfly House & Insectarium location. Starting in the fall of 2019 we’re taking the show on the road. 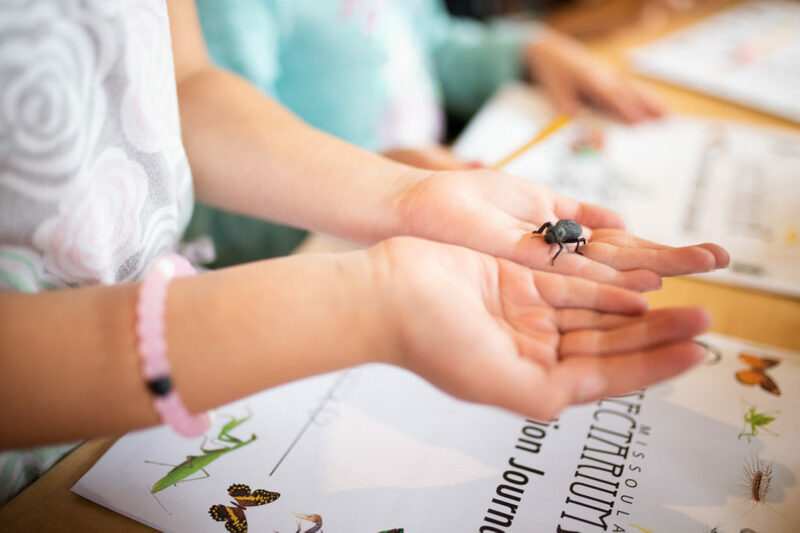 Each field trip will bring Bug Ambassadors into teachers’ classrooms, feature an enthusiastic and knowledgeable instructor and be aligned with Next Generation Science Standards. These prices include travel costs within a 20 mile radius of Missoula. Beyond that, standard state set mileage reimbursement fees apply. All programs feature one classroom visit, are one hour long and follow the pricing structure laid out above except for Powerful Pollinators. See program description for details. We LOVE playing to learn about bugs with preschool classrooms and groups. During each program we’ll meet a friendly Bug Ambassador, act out something cool about that bug and then do a simple and fun craft that helps us to keep learning about that animal. These programs are designed to be fun, simple and active – perfect for young learners with a healthy case of the wiggles. What would a bug look like if it were perfectly adapted to camouflage with your schoolyard habitat? In this fun and creative program students will practice their observation skills on bugs from around the world that are experts in the art of camouflage, discussing how these traits help them to survive. The adventure wraps up with a chance to design an insect, a brand new species, using leaves and other natural elements from around your school to inspire its camouflage. What kind of inventions can we come up with if we use the bugs around us for inspiration? 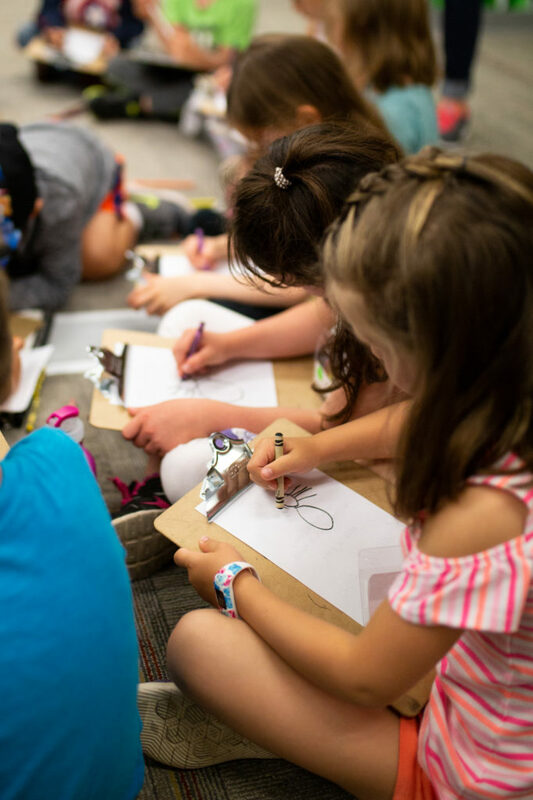 During each visit students will observe Bug Ambassadors and participate in engineering challenges to prototype an invention inspired by that animal. Thanks to a partnership with the Missoula County Weed District this program is being offered free of charge. This program features two visits to the classroom: one lead by the Weed District to explore structure and function of native plants that aid in pollination and one by the Missoula Insectarium to investigate the structures of insect pollinators that aid in the distribution of pollen. The program culminates in a field trip to a local open space area with both organizations to observe insects and plants in their native habitats. The emphasis of Powerful Pollinators is less about identifying specific species and more about helping students develop the ability to observe, make connections, ask questions and argue from evidence, all in the context of pollination. During this program students will discover the fascinating world of the aquatic arthropods with which we share the local rivers and streams. These amazing animals have unique life cycles and fascinating adaptations and traits. Students will pour through bins of river water to observe and sort the nymph stages of caddisflies, stoneflies, mayflies and more. The Insectarium has a series of exciting arthropod-based experiments that are suitable for 4th – 6th grades. Students will learn a range of new things about the arthropods featured in the experiment and hone their scientific skills. Teachers can choose from one of two experiments. The first experiment investigates habitat preferences experiment using roly polys, while the second tests and calculates the strength of bess beetles. Both focus on the construction of a hypothesis and simple experiment design, and provide ample hands-on time with the Bug Ambassadors. Scheduling for these programs has not yet begun but fill out this short form to let us know a little bit more about your class and we’ll reach out as soon as we get that ball rolling! Will you be looking at a program for your whole grade level or just your individual class? If your whole grade level, how many classes are there?